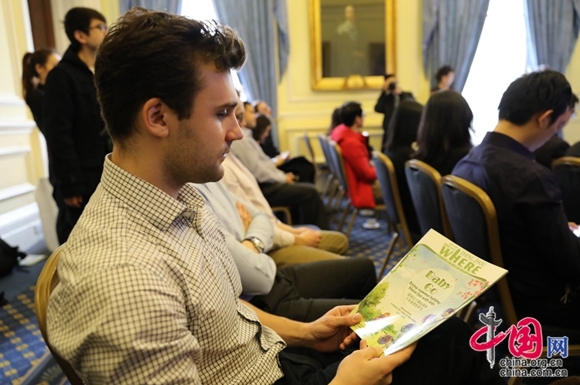 On Jan. 15, "2019 Falling in Love with Zhengzhou," an event to promote Zhengzhou, the capital of Henan province, was officially launched in London, the U.K.
A guest at Zhengzhou's promotional event in London checks out a magazine about the Chinese city. As part of the promotion, the radio program "Zhengzhou Radio Week" went live to be broadcasted on the U.K. app of the European Times, Propeller TV, overseas social platforms, and Zhengzhou People's Radio. The radio program covers topics including history, culture, food, and the economy of Zhengzhou. Frank Li, deputy managing director of the British Branch of the European Times, said that in recent years, more and more British people have shown interest in China and started learning the Chinese language or doing business in China. He said this was because of China's continuous development, and Chinese cities going out and introducing China to more foreigners. Darcy Littler, a British journalist who lived in China for seven years, said he is obsessed with the Chinese culture. Littler said he learned more about Zhengzhou from short videos about its culture that were shown at the promotional event. In recent years, Zhengzhou has been deeply involved in the Belt and Road construction, striving to build three "silk roads" – in the air, over land, and online. The U.K. is also actively participating in China's Belt and Road Initiative, suggesting that Zhengzhou and London have a lot of room for cooperation. 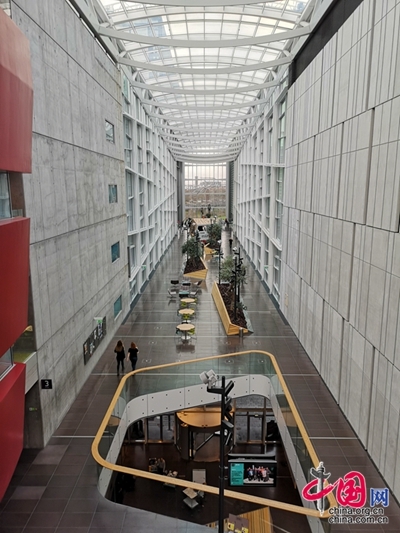 During the "Zhengzhou Radio Week," a Zhengzhou delegation was invited to visit two national radio stations: Danish Broadcast Corporation (DR) in Denmark's Copenhagen and the BBC in London. The delegates discussed with their hosts on topics of media convergence, channel setting, news production, and targetable audience. Danish Broadcast Corporation (DR) is the largest, most influential and oldest public radio and television station in Denmark. DR is the largest, most influential, and oldest public radio and television station in Denmark, as well as a founding member of the European Broadcasting Union. Agi Dudas, the film producer who heads the company's International Department, said, "I like Chinese traditional culture very much, and Denmark pays much attention to the inheritance and protection of its own traditional culture. Now it still has a serious music broadcasting channel. I am full of interest in Chinese culture and the rapid economic and social development in recent decades. I hope to have a chance to visit Zhengzhou, China." The BBC is the largest news broadcaster in the U.K. and one of the largest in the world. The editor-in-chief of the BBC's Chinese edition, Howard Zhang, led the delegation to visit the headquarters of the company in London, introduced its basic situation, and had an in-depth discussion on media convergence with the delegation. According to Zhang, media convergence is where the BBC is headed, while the real media convergence is the all-round integration of content collection, resource sharing and platform networking. The BBC still needs to keep trying and innovating on the road of media convergence, and it also hopes to communicate with Chinese media so that the two sides learn from each other, he said. In addition, at the invitation of Deutsche Bahn, a wholly-owned subsidiary of Deutsche Bahn Group, the delegation also visited its Hamburg Billwerder port. 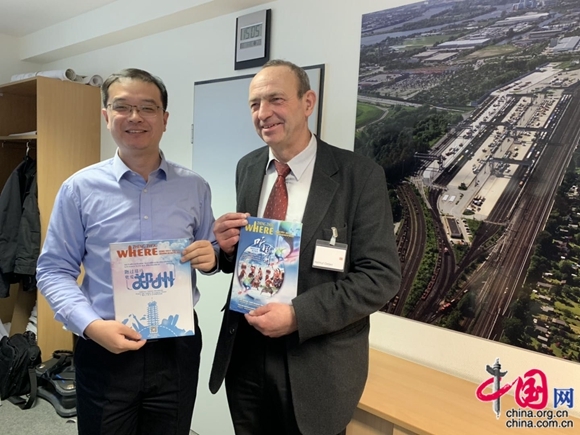 Qu Penghui, director of the Information Office of Zhengzhou Municipal People's Government, presents magazines to the official of Deutsche Bahn. Helmut Oetjen, senior adviser for Deutsche Bahn in North Germany, briefed the Zhengzhou delegation on the transit points in Germany, Austria, and Switzerland, as well as the network covering the whole of northern and southwestern Europe. Referring to China Railway Express (Zhengzhou), Oetjen said that in recent years, freight volume and frequency have been increasing steadily. Compared with the time-consuming sea transportation and expensive air transportation, the transportation cost of China Railway Express is low. It only takes 12-14 days for goods to arrive at Hamburg Billwerder port from Zhengzhou, from which it takes only one day to ship the goods across Europe. China Railway Express (Zhengzhou) has a considerable competitiveness and development space in connecting the transportation between China and Europe. Oetjen said he believes this is a great freight corridor connecting Asia and Europe, and that he also hopes for friendship between China and Europe to become stronger and stronger with the continuous development of China Railway Express (Zhengzhou). The overseas promotional event for Zhengzhou's city image was organized by the Information Office of Zhengzhou Municipal People's Government and undertaken by Zhengzhou People's Broadcasting Station and the British Branch of the European Times. Zhengzhou has held the "Falling in Love with Zhengzhou" promotional events in Russia, Finland, Turkey, Kenya, and other countries since 2014.